[JEWISH BRIGADE]. Broadside. Palestine, 1943. By “National People.” 1 p. 9 ¼ x 13⅝ in., in Hebrew. As part of the British Army, several Jewish battalions were issued “Palestine” cloth insignia for their uniforms. 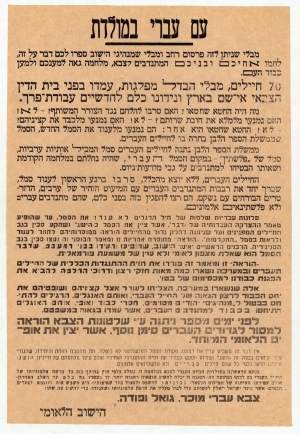 In 1943, some 69 Beitar and Irgun members of the regiment refused to wear the non-Zionist emblem and were court-martialed and sentenced to two months hard labor. The Jewish Brigade Group distinguished itself for its actions in Europe and North Africa during the war.